The scene is quite familiar to many people: a nervous, well-intentioned, but sometimes ill-prepared Bible teacher stands or sits before the class, reads a passage of Scripture, and then begins a discussion with this simple question, “What does this mean to you?” The question seems innocent enough. Many people find it quite appropriate. After all, Bible teachers don’t know everything, and class discussions can be very beneficial.1 So why not give everyone an opportunity to tell the class what a Bible verse means to them? In short, because it simply does not matter what a particular Bible passage means to you or me. The actual, true explanation of the text is ultimately all that matters (i.e., what did God mean?). If there is a right interpretation of a section of Scripture, then that particular, correct explanation should be the only interpretation we seek. 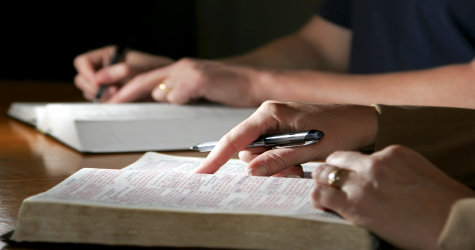 Application of the sacred text to our own individual lives certainly is vital to genuine Christian living, but first, we must come to a right understanding of the text (Ephesians 5:17).2 How do we do this? By allowing God to explain Himself. Similar to how we frequently ask those with whom we are engaged in conversations to explain themselves when they use words or expressions that we do not understand, if God gave us the Bible, then we need to seek His explanation of His Word. Whenever possible, we must allow the Bible to explain itself. This principle of Bible interpretation is both logical and God-honoring. As great and faithful as was Joseph the patriarch, he informed the King of Egypt that “it is not in me” to interpret Pharaoh’s divinely revealed dreams (Genesis 41:16).3 God was the only One Who knew for sure what the dreams meant (since He was the One Who caused them in the first place), and He chose to give Joseph the meaning so that he, in turn, could inform Pharaoh. More than 1,000 years later, Nebuchadnezzar, King of Babylon, also had a special dream from God. As he sought a revelation and an interpretation of the inspired dream, the prophet Daniel informed the king that “there is a God in heaven Who reveals secrets” (Daniel 2:28). Only when God revealed the meaning of the dream to Daniel (2:19-23) could he in turn be of real help to Nebuchadnezzar. In essence, the faithful prophet Daniel logically and honorably allowed God to explain Himself. When “rightly dividing the word of truth” (2 Timothy 2:15) by using the Bible to explain the Bible, we must handle the potential associated passages with the utmost integrity and care. Do the verses actually relate to the primary passage in question, or am I rather carelessly using them to “prove” a preconceived idea? Do I actually understand the secondary passages in their own contexts, or am I rushing ahead to use them to “explain” the principal passage, when I have not yet even understood the supposed “inspired commentary” (the secondary passages)? Second Peter 3:8 is one of the most frequently cited proof texts for the six days of Creation actually being thousands of years (or more) long. Allegedly, “Peter said, ‘One day is a thousand years and a thousand years is one day,’ thus the days of Creation were (or at least could have been) a thousand years (or more) long.” Sadly, for many Christians, 2 Peter 3:8 has become their leading commentary on Genesis 1. Notice first of all that Peter does not actually say, “With God one day is a thousand years and a thousand years is one day.” The apostle actually wrote: “[B]eloved, do not forget this one thing, that with the Lord one day is as (Greek hos) a thousand years, and a thousand years as (hos) one day.” Peter used a figure of speech known as a simile to compare a day to a thousand years. It is not that one day is precisely equivalent to 1,000 years or vice versa. Rather, within the specific context of 2 Peter 3, one could say that they share a likeness. In 2 Peter 3, the apostle reminded Christians that “scoffers” would arise in the last days saying, “Where is the promise of His [Jesus’] coming?” (vss. 3-4). Peter declared: “[T]he heavens and the earth…are reserved for fire until the day of judgment and perdition of ungodly men” (vs. 7). Regardless of what the scoffers alleged about the Second Coming, Peter wanted the Church to know that “the Lord is not slack concerning His promise [of a return], as some count slackness, but is longsuffering toward us, not willing that any should perish but that all should come to repentance” (vs. 9). Sandwiched between these thoughts is the fact that the passing of time does not affect God’s promises, specifically the promise of His return. If Jesus promised to return 1,000 or 2,000 years ago, it is as good as if He made the promise one or two days ago. Indeed, “with the Lord one day is as a thousand years, and a thousand years as one day.” With men, the passing of long periods of time generally affects their keeping of promises, but not with God. Time has no bearing on whether He will do what He said He would do: “a thousand years are like a day” (vs. 8, NIV). Although there is always the possibility of misusing Scripture when seeking to understand it (just as any communication can be misunderstood when treated carelessly), we must not allow the potential mistreatment of God’s Word to keep us from carefully and sincerely interpreting it. The saving faith of Jesus Christ “comes by hearing and hearing by the Word of God” (Romans 10:17). Hearing and understanding the revelation of God both precedes faith and continues working alongside it as faithful men and women continue to “grow in the grace and knowledge of our Lord and Savior Jesus Christ” (2 Peter 3:18). Just as the Corinthian Christians were expected to “understand, even to the end” (2 Corinthians 1:13), a continual proper understanding of God’s Word is vital to our spiritual success throughout life. Like the Bereans, we must seriously “search” or “examine” (Greek anakrino) the Scriptures in a noble, fair-minded fashion (Acts 17:11). The Greek word anakrino means to “engage in careful study of a question;” to “question, examine.”9 It is to “sift up and down;” “to make careful and exact research as in a legal process.”10 Similar to how Pilate “examined” (anakrino) Jesus and found no fault with Him concerning the things of which He was being accused (Luke 23:14), the Bereans examined the Scriptures daily to see whether the things that Paul preached were true. There is a commendable, reasonable manner in which to interpret Scripture, including and especially, allowing God to explain Himself—using the Bible to illuminate the Bible. Exodus 20:11—To “Make” or to “Remake”? Several years ago, I listened to an evolutionary-sympathizing, radio evangelist emphatically and repeatedly stress that Exodus 20:11 does not mean that God created the Universe and everything in it in six days. Instead, God supposedly “fashioned” or “remade” the Universe in six days after an original creation billions of years earlier. Allegedly, between the time God (1) “created” the world (Genesis 1:1), and (2) “made” (or “recreated”) the world (Genesis 1:3-31), billions of years of time transpired in which evolution supposedly took place. This gentleman based his entire argument about Exodus 20:11 on the belief that “to create” (Hebrew bara) and “to make” (Hebrew asah) always mean two different things in relation to God’s creative acts. The problem with this theory (commonly known as the Gap Theory) is that the inspired “explanatory notes” God has given us throughout the Old Testament concerning the events recorded in Genesis 1 reveal that the words “create” (bara) and “make/made” (asah) are used interchangeably in reference to the creation of the Universe and everything in it. Since Exodus 20:11 refers to the events that took place in Genesis, it is quite appropriate to revisit the book of beginnings to see how these two words are used in reference to what took place during the Creation. In Genesis 1-2, bara and asah are used several times in reference to God’s work. Interestingly, they never stand at odds with one another; they teach one central truth: God created/made the Universe and everything in it in six days. For example, on day five “God created (bara) great sea creatures and every living thing that moves” (1:21), while on day six “God made (asah) the beast of the earth according to its kind” (1:25). On day six of Creation, God said: “Let us make (asah) man in Our image, according to Our likeness.” Then we are told in the very next verse that He “created (bara) man in His own image.” When Moses commented on this day of Creation in Genesis 5:1-2, he again used these words interchangeably: “In the day that God created (bara) man, He made (asah) him in the likeness of God. He created (asah) them male and female” (5:1-2). In Genesis 2:4 Moses summarized the events of Creation, stating: “This is the history of the heavens and the earth when they were created (bara), in the day that the Lord God made (asah) the earth and the heavens.” The phrases “the heavens and the earth…were created” and “God made the earth and the heavens” parallel each other. They are two ways of saying the same thing. Notice the prophet Isaiah’s use of four different Hebrew terms (including bara and asah) to refer to God’s work at Creation: “For thus says the Lord, Who created (bara) the heavens, Who is God, Who formed (yatsar) the earth and made (asah) it, Who has established (kun) it, Who did not create (bara) it in vain, Who formed (yatsar) it to be inhabited: I am the Lord, and there is no other” (Isaiah 45:18). Did God intend to communicate a different message every time He used different words to describe something? Not according to His inspired commentary. Just as you may tell one person, “I mowed the yard,” you might mention to someone else that “I cut the grass.” You have spoken one truth, even though you used two different phrases. Gap theorists who contend that the Hebrew words bara and asah must have two different meanings when referring to God’s creative acts “in the beginning,” and who allege that Exodus 20:11 (and other verses) refer to a re-creation of Earth and everything on it, are not logically and fairly interpreting the Bible. Rather than respectfully allowing God’s Word to explain itself, it seems they have chosen to use the latest theories in old-Earth, evolutionary science to manipulate the Scriptures to their liking. John 2:4—Was Jesus Disrespectful to His Mother? Prudent world travelers take into consideration the differences in the countries they visit. They carefully consider their words and actions, knowing that sometimes the same word or action can mean two totally different things in different places at the same time. Wearing “pants” (trousers) in the U.S. is not equivalent to wearing “pants” (underwear) in England, nor is holding up two fingers (which may be interpreted as an obscene gesture by Englishmen). Similar to conscientious world travelers who fairly interpret the words and actions of those in other countries according to the language and customs of those countries, Bible students must interpret the Bible with the Bible. Allowing the Bible to explain itself is fundamental to a proper understanding of it since the events of Scripture took place in very different times in different places with different people who spoke different languages and who had different customs. As to why Jesus used the term “woman” (gunai) instead of “mother” (meetros) when speaking to his own mother, we simply do not know.18 We must be careful to say “why” someone did or said something a certain way if the Bible does not give some indication, especially if we are assuming the worst about an individual.19 Contemplating and discussing why Jesus made this statement (and many others which may be left unexplained) is not wrong.20 We simply must differentiate between Bible-inspired explanations and the uninspired suggestions of men (however interesting they may be). Mark 8:31—On What Day Exactly Did Jesus Rise From the Dead? The most frequent reference to Jesus’ resurrection in the New Testament reveals that He rose from the grave on the third day of His entombment. Matthew and Luke both record Jesus as prophesying that He would rise from the grave on this day (Matthew 17:23; Luke 9:22). The apostle Paul wrote in his first epistle to the Corinthians that Jesus arose from the grave “the third day according to the Scriptures” (1 Corinthians 15:4). And while preaching to Cornelius and his household, Peter taught that God raised Jesus up “on the third day” (Acts 10:40). According to Mark 8:31, however, Jesus predicted that He would “be killed, and after three days rise again” (Mark 8:31). How could Jesus arise both “on” and “after” the third day? Does the Bible help explain this difference in time in the most important event in the history of the world? Indeed, it does. When the Israelites visited King Rehoboam and asked him to lighten their burdens (2 Chronicles 10:3-4), he wanted time to contemplate their request, so he instructed Jeroboam and the people of Israel to return “after three days” (10:5). Verse 12 of that chapter indicates that Jeroboam and the people of Israel came to Rehoboam “on the third day, as the king had directed, saying, ‘Come back to me the third day.’” Interesting, is it not, that even though Rehoboam instructed his people to return “after three days,” they understood him to mean “on the third day” (cf. 1 Kings 12:5,12). In Acts 10, we glean further insight into the ancient practice of counting consecutive days (in part or in whole) as complete days. Luke recorded how an angel appeared to Cornelius at “about the ninth hour of the day” (10:3, approximately 3:00 p.m.). “The next day” (10:9) Peter received a vision from God and welcomed visitors sent by Cornelius. “On the next day” (10:23) Peter and the servants of Cornelius departed for Caesarea. “And the following day they entered Caesarea” where Peter taught Cornelius and his household the Gospel (10:24). At one point during Peter’s visit, Cornelius spoke about his encounter with the angel of God. Notice carefully how he began the rehearsal of the event. He stated: “Four days ago to this hour, I was praying in my house during the ninth hour” (10:30, NASB). Although the event really had occurred only 72 hours (or three literal days) earlier, Cornelius spoke of it as taking place “four days ago to this hour.” Why four days instead of three? Because according to the ancient Jewish method of reckoning time, a part of the first day and a part of the fourth day were counted as whole days. Surely one can see how this information aligns itself perfectly with Jesus’ burial taking place on Friday and His resurrection occurring on Sunday. A part of Friday, all day Saturday, and a part of Sunday would be considered three days in ancient times, not one or two. By studying these and other passages,21 one can see clearly that the Bible uses expressions such as “three days,” “the third day,” “on the third day,” “after three days,” and “three days and three nights” to signify the same period of time. Further evidence proving that Jesus’ statements regarding His burial were not contradictory center around the fact that even His enemies did not accuse Him of contradicting Himself. No doubt this was due to their familiarity with and own use of the flexible, customary method of stating time. In fact, the chief priests and Pharisees even said to Pilate the day after Jesus was crucified: “Sir, we remember, while He was still alive, how that deceiver said, ‘After three days I will rise.’ Therefore command that the tomb be made secure until the third day” (Matthew 27:63-64). The phrase “after three days” must have been equivalent to “the third day,” else surely the Pharisees would have asked for a guard of soldiers until the fourth day. Interesting, is it not, that modern skeptics charge Jesus with contradicting Himself, but not the hypercritical Pharisees of His own day? The expressions that Jesus and the Bible writers employed to denote how long Jesus would remain in the grave does not mean that He literally was buried for 72 hours. If we interpret the account of Jesus’ crucifixion, burial, and resurrection in light of God’s divine commentary (as well as helpful, uninspired historical writings which shed light on the culture of the day),22 and not according to the present-day (mis)-understandings and biases, we find perfect harmony in the expressions that Jesus and the gospel writers used to describe Jesus’ resurrection from the dead. How often have we “heard” God, but not actually understood Him? Twentieth-century American author and children’s book illustrator Robert McCloskey once stated, “I know you believe you understand what you think I said, but I’m not sure you realize that what you heard is not what I meant.”23 Sadly, billions of people on Earth either don’t care what God’s Word says or they don’t care enough to put forth the effort to understand it properly. Some things are definitely harder to understand than others, and some things we may never fully understand, but one thing is for sure: if we humbly and honestly allow the Bible to explain itself whenever possible, we will successfully arrive at the proper conclusions that God intended for us to reach. 1 Both as a student and as a teacher, I have often benefited from the scriptural, relevant, and practical comments of others in a Bible class. 2 “Explanation” logically precedes “application.” That is, we cannot apply what we do not understand. 3 All bold text in Scripture quotations has been added for emphasis. 4 Read 2 Peter 1:3; John 16:13; 14:26; 2 Timothy 3:16-17; Ephesians 3:1-5; Jude 3; Revelation 22:18-19. See also Eric Lyons (2003), “Hearing God in the Twenty-First Century,” http://apologeticspress.org/APContent.aspx?category=11&article=912&topic=86. 5 Commentaries are often helpful in noting corresponding historical information, which leads to a better overall understanding of the time, place, and setting of a particular book of the Bible. The underlying Greek, Hebrew, and Aramaic words are also frequently defined and discussed in a search for a better understanding of the text. 6 Keep in mind, just as the apostles did not understand all of Jesus’ teachings during His ministry (cf. Mark 9:32; John 12:16; 13:7), there are likely a number of things that we will never fully understand about the Bible this side of eternity. No doubt, we can understand everything we need to know to become a Christian and to live the faithful Christian life (John 8:32; 1 John 5:13; 1:5-10), but there may be many things about angels, the Trinity, Satan, heaven, hell, the indwelling of the Holy Spirit, etc. that we will likely never fully understand while on Earth. Perhaps one way God tests the sincerity of our hearts is by examining whether or not we are willing to concede that we are uncertain what some Bible passages mean exactly. 7 Some argue that since “God is not bound by time” and “could have taken as long as he wanted to create the Universe and everything in it,” then the days of Creation could have been thousands of years (or more) long. The point, however, is not whether God is outside of time (He most certainly is; Psalm 90:2), but what God has revealed to us—both in Genesis 1 and in the rest of Scripture. God could have created the Universe in any way He so desired; in whatever order He wanted, and in whatever time frame He so chose. But the question is not what God could have done; it is what He said He did. And He said that He created everything in six days (Exodus 20:8-11). Cf. Eric Lyons (2014), “Creation and the Age of the Earth,” http://apologeticspress.org/APContent.aspx?category=9&article=5000&topic=327. 8 Even if 2 Peter 3:8 could be tied to the length of the Creation days (logically and biblically it cannot), adding 6,000 years to the age of the Earth would in no way appease evolutionary sympathizers. A person could add 600,000 years or 600 million years and still not come close to the alleged age of the Universe. According to evolutionary calculations, one would still be 13+ billion years away from the Big Bang and four billion years this side of the formation of Earth. Truly, even an abuse of 2 Peter 3:8 will not help Day-Age theorists. 9 Frederick Danker, et al. (2000), Greek English Lexicon of the New Testament (Chicago, IL: University of Chicago), p. 66. 10 A.T. Robertson (1997), Robertson’s Word Pictures in the New Testament (Electronic Database: Biblesoft). 11 Justin Rogers (2015), “Is the Gap Theory Linguistically Viable?” Reason & Revelation, 35:134-141, http://apologeticspress.org/apPubPage.aspx?pub=1&issue=1208#. 12 Richard Dawkins (2006), The God Delusion (New York: Houghton Mifflin), p. 250. 13 Dennis McKinsey (2000), Biblical Errancy (Amherst, NY: Prometheus), p. 251. 14 Dennis McKinsey (1995), The Encyclopedia of Biblical Errancy (Amherst, NY: Prometheus), p. 134. 15 Marvin R. Vincent (1997), Word Studies in the New Testament (Electronic Database: Biblesoft). 16 A.T. Robertson (1932), Word Pictures in the New Testament (Nashville, TN: Broadman), 5:34. 17 Adam Clarke (1996), Adam Clarke’s Commentary (Electronic Database: Biblesoft). 18 Admittedly, the use of “woman” seems to have been an unusual way to address one’s mother in first-century Hebrew and Greek cultures. 19 Generally speaking, people understand the importance of the principle of being “innocent until proven guilty.” In our daily lives, we generally consider a person to be truthful until we have actualevidence that he or she has lied. In addition to giving peoplethe benefit of the doubt and generally considering them to be truthful about a matter unless we have evidence to the contrary, when we read a historical document or book, the same rule applies. The writing is considered to be truthful until it can be proven otherwise. of Man’ who was to bring the realities of heaven to people on earth (1:51)” (, The Gospel According to John [Grand Rapids, MI: Eerdmans], revised edition, p. 159). 21 Genesis 42:17-24; 1 Kings 29:20; Esther 4:16; 5:1. 22 The Jerusalem Talmud, for example, quotes rabbi Eleazar ben Azariah, who lived around A.D. 100, as saying: “A day and night are an Onah [‘a portion of time’] and the portion of an Onah is as the whole of it” (Shabbath ix. 3, as quoted in Harold W. Hoehner , “Chronological Aspects of the Life of Christ—Part IV: The Day of Christ’s Crucifixion,” Bibliotheca Sacra, July, 131:248-249, bracketed comment in orig.). Azariah was indicating that a portion of a 24-hour period could be considered the same “as the whole of it.” Cf. John Lightfoot (1979), A Commentary on the New Testament from the Talmud and Hebraica (Grand Rapids, MI: Baker), pp. 210-211. 23 Attributed to Robert McCloskey, U.S. State Department spokesman by Marvin Kalb, CBS reporter, in TV Guide, March 31, 1984, citing an unspecified press briefing during the Vietnam war, http://quotes.yourdictionary.com/author/quote/601648.